Sound the alarm! The yellow Kryptomite™ has stolen Batgirl’s ePad and is speeding off on its buggy! This little Kryptomite scares easily, so keep your eyes on him. Help Batgirl™ give chase in her awesome Batjet. Fire the stud shooters and release the net to stop the sneaky little Kryptomite in its tracks. Nobody steals Batgirl's ePad! Price is 20% below the initial Lego retail price, a € 5.04 discount! This comes down to 9.68 cent per brick. 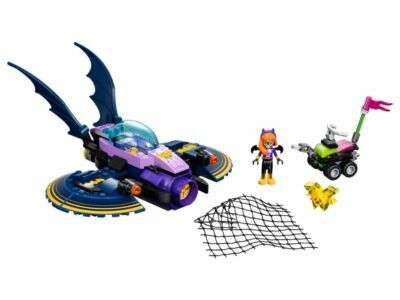 The Batgirl™ Batjet Chase (41230) Lego set is no longer directly available from the sites below. However, 3rd party partners of these sites might still have the set available. Alternate description Recover Batgirl’s ePad from the evil Kryptomite™! Includes a Batgirl™ mini-doll figure and a yellow Kryptomite™. Features a Batjet with opening cockpit, stud shooters on the wings, net launcher on the front and storage space for Batgirl’s ePad. Also includes a buggy with a grabber in front to hold Batgirl’s ePad. Fire the stud shooters and launch the net to capture the Kryptomite’s buggy. Accessory elements include a net, Batgirl’s ePad and two studs for the shooters. Batjet measures over 3” (9cm) high, 6” (17cm) long and 6” (17cm) wide. Kryptomite™ buggy measures over 2” (6cm) high, 2” (7cm) long and 1” (3cm) wide.